These are a great treat for friends and family during Easter. Turmeric is a surefire way to add vibrant colour to the regal icing without having to find vegan-friendly food colouring. And don’t worry…it doesn’t leave a strange taste. These are really scrumptious! 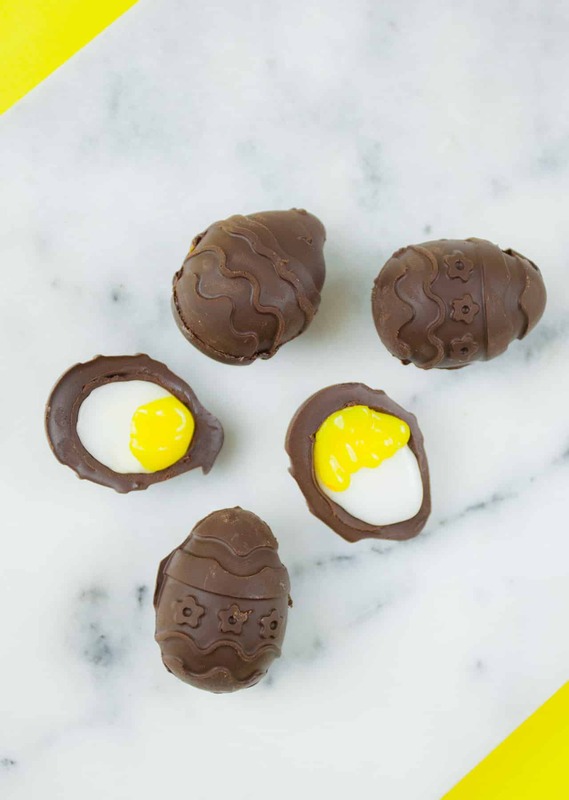 This recipe makes extra icing to fill the eggs because it depends what mould you will be using and how much chocolate you remove from the middle. But you can always make more if you have any left over. Makes 5 vegan creme eggs. 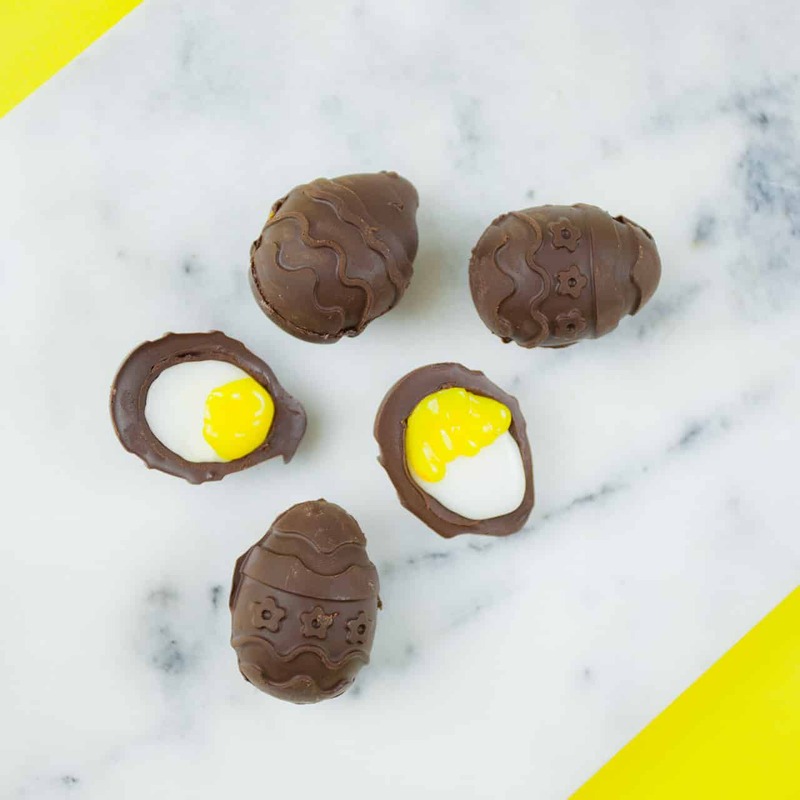 Break chocolate into small pieces and place in a heatproof bowl. Place the bowl above a pan with simmering water and melt the chocolate completely. Transfer chocolate to a measuring jug and slowly pour into the mould so each compartment is full. Gently shake the mould to remove any air bubbles, then freeze for 10 minutes. Meanwhile, grate the regal icing and put 100g in a bowl. Set aside the remaining 150g in a separate bowl. Add the sugar and water to a pan over a low heat until the sugar is completely dissolved. Add the turmeric and vanilla extract to the 100g of regal icing, along with a few spoons of the sugary water. Mix until smooth. Add more of the liquid if required. Add the remaining sugary water to the 150g of regal icing and mix until smooth. Remove the mould from the freezer and spoon out the middle of each half using a teaspoon. Pipe the plain icing mix into two thirds of each egg half and pipe the turmeric icing mix into the remaining third. Freeze for at least a further 20 minutes (or longer depending on how soon you want to eat the eggs). Remove the mould from the freezer and push out egg halves. Dip the end of a chopstick in the remainder of the melted chocolate and brush the stick over the edges of each egg half. Stick two halves together to form an egg. Leave to soften until ready for eating!